Just because a man discovers he is £140 less poor does not mean he is going to go out and get blathered. I have been out and got blathered. I even went to Morrisons and got a laof of 50p bread, a tine of 34p sardines in tomato sauce, a 50p pack of cherry-ish tomatoes, and a 6 quid bottle of Cava. The Cava is crap. Hang on and I will top up. read the label, and name. lavit brut nature Segura Viudas is what it says on the label (and yes, I have brought it to the computer to read, slowly). If I was not giddy with the sudden lessening of my poverty I would have walked home and got the much better, and cheaper, Lidl cheap Cava, which does not taste like it had chip oil added. On the other hand, on a normal day I would not have splashed out on Cava. and the sardines and bread at Lidl is way too expensive for me. Morrisons’ cheapest bread is the best cheap bread of any supermarket chain. Better than Tesco’s or Sainsbury’s, and a lot better than the asbestos bread of Asda (I already have firm opinions about Asda, one of the few things I have strong opinions about). In my experience the best cheap bread in the UK now is sold in good Polish shops (and possibly shops run by the descendants from other nation’s once near the old USSR). There is a Ukrainian bakery quite near me, off Manchester Road, and their bread is a mass of joy in the mouth, but until now I have never thought of walking up there of a morning to buy fresh bread. I will check for myself in the next few days, but I do wonder if my spelling gets better with being blathered. I have never found spelling easy. English is the least phonetic of the phonetic languages to write (there is almost no clue in a spoken word to help you spell it, or in a written word to help you say it) so it may not be just the fact I am a lazy toe-rag. I was all set to go down to Bradford this morning to pay off about £140 for credit card and Council Tax demands. I checked the Council Tax bill and discovered it was a final demand, had been sent 10 days ago, and that I had to pay within 7 days or a summons with an automatic £85 fine would be issued. Meaning I was going to drown in sewage. I called, and discovered that the bill was now void because they had processed my claim as a self employed poor person. I still have to pay £60 a month, and that might be enough to force me back on the dole, but I now have at least 28 days to find the money. I then discovered my credit card was in credit. I am turning into my mother! She once had a Co-op credit card which she used once, over paid the next month, then paid the amount shown as credit every month for over a year. If she did not end up lending the Co-op over a thousands pounds it was not far short! I have not lent my card company a vast amount, but enough for me to able use the cash on the card to once again pay to be a member of the RNLI after many years being too poor to pay. My father, his father, and 2 of my mother’s brothers spent time at sea, those in peril on the sea deserve every help, and the RNLI helps them without tax payers support or Government interference. Strange racist encounter in Bradford. I had a truly bizarre (even by my standards) street encounter on my way home on Sunday. I was staring into a big hole at the end of my street, dug by Yorkshire Water, wondering why they needed a new big hole, seeing they had dug lots of them here less than two years ago. A rusty white van pulled up behind me and the driver told me not to jump in! He was a South Asian (ie. descended from what was British India, or thereabouts), middle aged, and had a bit of a Bradford accent. It was bizarre enough that anyone might think someone would try to kill themselves by jumping into a 3 foot deep hole! But it got even weirder. He told me his father came to Bradford in the 70’s, and that he ran his own factory. He then pointed to two young lads passing the other side of his van, and said they were from Bulgaria. They were not! They were talking Urdu and were almost certainly of Pakistani descent. The bloke then told me Enoch Powell had the right idea and that there were too easy for immigrants to get into Britain! I listened, but at the point he started telling me how all the immigrants were on benefit fraud I wished him a good afternoon, and told him I was going home for a nice cup of tea. Instead of letting go for my tea he carried on even more racist than before; at which point I rather lost my temper. I was mostly polite, but did point out that factory owners did not drive rusty, knackered vans, and that he was probably lying out of his arse! I wished him a good day, and as I was walking away he drove off, shouting that if I did throw myself in the hole and kill myself it would be better for everyone. What the hell was he up to!? Spending a Sunday afternoon driving around looking for people on their own so he could have a racist diatribe at them! Whatever his ethnic origins he certainly appeared to be a member of the world wide tribe of nasty nutters! A few years ago, me not blogging for a week could mean illness or depression. Now it it more likely to mean that I have been busy. I have been laying loft floor boards and striping and painting a kitchen. I have not done more than 7 hours on any one day, but some of the work has involved lifting, carrying and working with heavy things, a lot of it while wearing a cheap face mask. I discovered that wearing a face mask, and doing heavy physical work, can make me hyperventilate! I had to lie down at one point like some Victorian lady in a corset on the edge of fainting. Most of the kitchen work involved trying to fix up the bodges by the BBM (Bloke Before Me). I do not have the tools, closed face gasmask, or the skill to take the plaster back to brickwork and replaster; and that is the only way get a smooth surface for painting in that kitchen; and I am fairly certain taking it back to brickwork would reveal bodges requiring a whole Tony Walsh show to fix. This morning I made a foot tall Bradford City hat out of a straw hat, a towel, and a bit of the box the last but two printer came in. Including cutting the box and ironing and sewing up the towel it took me 26 minutes! I did the hat to lead another Bradford walk, this one with Dave Pendleton, the man with the info. It was the start of Bantam’s History Week, and the walk was my suggestion. A dozen people showed up. and we collected £85 for the Burns Unit (if you cannot think why we collected for them then please read some Bradford City history). It went brilliantly well, and “i am not just saying that because a gorgeous young woman called Kath did the walk and then bought me beer. No! REALLY!! 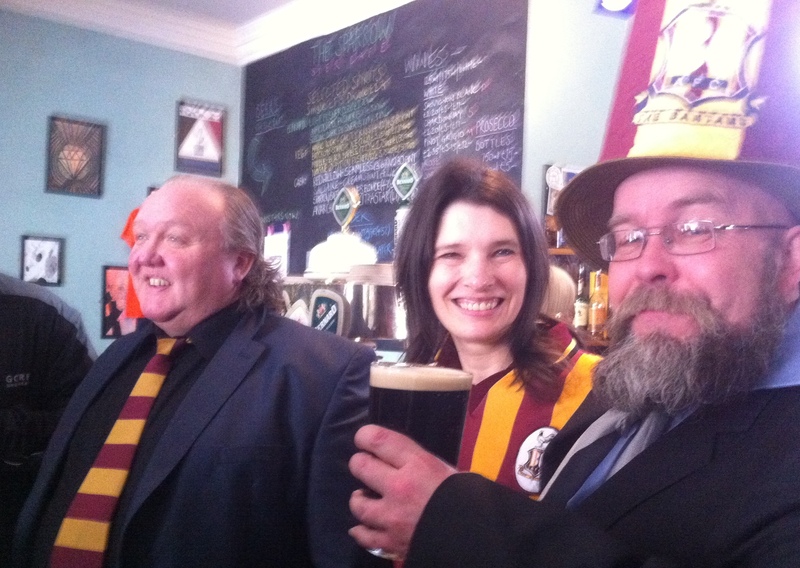 We started at the Turls Green, had a pint in the Midland, and finished at The Sparrow Beir Cafe, where Bradford City Chairman Mark Lawn pulled a pint of Baine’s Bitter, brewed in memory of the first ever football collectors cards, which were printed in Bradford. I then went and saw City win a league game, so guaranteeing a place in the play-offs. Bradford City Chairman Mark Lawn, the astonishingly good looking Kath, and Glyn Watkins holding a beer bought by Kath, and wondering when he would wake up! My dad would have been 90 today. My dad was born on 20th April, 1923. I was with him when he died, but I did not remember the date of his coming into the world, until I called my mum to tell her about the good day me and Bradford City had had. Lost day and free beer! On Tuesday I could not believe it was not Wednesday. Today I spent almost the whole day acting like it was Wednesday, so I guess I am now evened up on my days? Spent last night at Bev’s, after meeting her in Shipley so we could get the paints for her kitchen, the next big job (potentially bigger even than my mother’s stairwell!). We were both kept awake by wind, and, for a change, it was outside the house. I also discovered this morning that my insulin pen might have been injecting air for the last one or two doses. It was a new cartridge, so possible, but it has never happened before. I was fine but it was a puzzle, and may have been the reason I lost a day in my mind. I spent today doing lots of bits and pieces to make ready for the start of the job, including clearing out Bev’s ‘shed’ that had not been touched since she filled full of the stuff from the man before me. I found enough light coloured paint to do her kitchen, so I guess she could take what she payed for yesterday back, but I also found out the walls under the wallpaper is in such a state that light paint would need me to do 3 or 4 coats. On my way ‘home’ I called in The Turls Green (the start of Saturday’s A Walk Through the History of Bradford Sport at 10.00. After I got my pint I was offered a free bottle of the splendid Moorhouse’s Premier Bitter. Apparently they were left over from a ‘meet the brewer’ event this afternoon. If I had known about it I would not have spent so long working at Bev’s house! I like Moorhouse’s, but the only place I go to, that sells it regularly, is The Grove, Leeds; where I am hoping to be on Saturday to help John celebrate his latest birthday. I think he’s had at least 70 so far and is still working behind the bar, despite what his doctor tells him, but what do doctor’s know? Apart from more than most (and, judging by daytime television, that does not seem that hard).